U R Ananthamurthy was one of the first writes who endorsed the idea of Indian Writers' Forum. 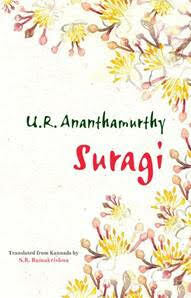 Here we publish an excerpt from his autobiography Suragi, translated by S R Ramakrishna. This is from the chapter "At the Sahitya Akademi and National Book Trust". Ananthamurthy was the President of the Sahitya Akademi — the national academy of letters. In 2015, several writers protested the Sahitya Akademi's silence over the murders of writers and rationalists in the country. This short extract from the book shows what an autonomous literary institution in the country can do. In the rare occasions we go beyond time and space, we see truths not just from the past but also those relevant to the present. I experienced this one night in Nepal. In 1996, some Indian writers spent three days with writers from Pakistan, Bangladesh, Nepal, and Sri Lanka. A Himalayan range loomed behind the resort where we were staying. The snow-clad mountains could be seen from the lounge and also from our rooms. It was an informal meeting, with no agenda, where the idea was to sit and chat and share our thoughts and feelings. This was after the demolition of the Babri Masjid. The anxiety of whether our nations could rise above communal hatred had brought us all together. Siddhartha, a friend from Bengaluru, had organised this conclave. He has set up an ashram called Fireflies in Bengaluru. Born a Christian, Siddhartha was drawn to Buddhism. He blends thought with action. Another writer at the conclave was my dear departed friend D.R. Nagaraj (1954–1998). He was drawn to two extremes—the Buddhist vision of emptiness that rejects even the idea of the soul, and the Nietzschean assertion of the intellect against the Christian concept of sin. I will only name one participant who had come from elsewhere: Urdu writer Intizar Hussain (1923–2016). Each writer spoke openly about the truths of their experience, without trying to justify themselves. They spoke of things they couldn’t speak about in their countries. Women writers had come from Pakistan and Bangladesh, and I feel I should only convey what they expressed, keeping them anonymous. Among the writers from Bangladesh was a Hindu. We gathered he was a big poet there. He was fidgeting with a palmtop he had bought in the Nepal black market. It was a device on which one could take notes. He was trying to fi gure out how it worked, and muttering in frustration when he couldn’t. He said the moment the Babri Masjid was demolished, several Kali temples in Dhaka had been brought down. ‘Why don’t any of you speak about it? I am no Kali devotee but I don’t like the hypocrisy of your secular position.’ No one argued with him. The other Bangla writers said he was speaking from the heart. Everyone was keen to break the vicious cycle of blaming the other to justify one’s own actions. Having said his bit, the Hindu writer from Bangladesh shared in our anxieties. It has become a politically correct ritual for us to talk about Muslim violence when we want to condemn Hindu violence, and Hindu violence when we want to condemn Muslim violence. We respond with cleverness when we lose the ability to see the victims as humans like us. The objective of this meeting, with both Hindus and Muslims, was to rid ourselves of such self-justifi cation. I share a conversation that suggests we were successful. We were lounging around comfortably, resting on mats and lolling on cushions. A middle-aged woman writer from Bangladesh began her tale softly, with her friendly, smiling eyes closed. She was the only woman writer wearing a sari. Her luxuriant, uncombed hair cascaded on her breasts. Perhaps she was secure in the confi dence that all of us were looking at her with compassion. When she began, she addressed everyone. As she progressed, she seemed to be directing her words to the male writers from Pakistan. Towards the end, her voice became tremulous. She was an ordinary woman speaking about the war Pakistan had fought with her country, then called East Pakistan. Her husband had been a professor at Dhaka University. He had campaigned for Bengali as a second official language. One day he routinely left for the university and didn’t return. The evening turned to night. A day passed, then two. Their two children didn’t go to school. They stayed at home, awaiting his return. They couldn’t venture out — Pakistani soldiers were everywhere, brandishing their guns. The sharp-nosed Intizar Hussain had placed his hands on his lap, in a meditative pose, and was listening to her. When the Bangladeshi writer concluded, a young woman writer from Pakistan began to sob uncontrollably. Intizar Hussain slowly raised his head. His eyes were moist, and tears rolled down his cheeks. ‘On behalf of my country I apologize to you,’ he said in English. ‘What can I say but that we are all unwittingly implicated in the murder of your husband?’ He looked at the other Pakistani writers for approval. The three women writers bowed their heads, endorsing his words with tears. This is an incident I will never forget. The human is dwarfed by the idea of the nation state. He loses his sense of right and wrong, and becomes a nationalist. In the Second World War, such nationalism made monsters of the Japanese and the Germans. Even ordinary folks turn blind. The atom bomb dropped by the Americans on Hiroshima and Nagasaki destroyed everything. Communist nations can justify their crimes using the words of Marx. Muslim nations can justify their crimes using the Prophet. It is equally true that Christian nations can use the Bible to justify their actions. Those hiding behind nationalism wreak a lot of damage before we wake up and criticize them. To escape the mass hysteria of nationalism, we must always fearlessly keep extending a hand of friendship to other humane thinkers. I recall an incident. When we met in Berlin, I mooted with Intizar Hussain the idea of our Sahitya Akademi publishing an anthology of Pakistani literature to mark the fi ftieth anniversary of our two countries attaining Independence. Like India, Pakistan has a diversity of languages: Punjabi, Sindhi, and others. I wrote to Intizar Hussain asking if he could edit an anthology of stories from all such languages in Urdu translation. We visited an ancient temple in Nepal in the middle of a small town. Its outer walls were replete with frescos with love-making scenes. The postures were so explicit they beat the Kamasutra. The young Pakistani writer who had cried the previous night gaped, covered her eyes with her hands, and teased me, ‘What do I say about you Hindus? Is this a place for the Gods?’ But she continued to examine one fresco after the other, trying to assuage her guilt by thinking of God. I smiled and said her inability to take her eyes off the carvings was also an aspect of bhakti. As if to mock my academic explanation, she laughed and said conspiratorially, ‘Has Intizarji seen me gaping? If he has, I am done in for. How can I be sure he won’t tell people in Pakistan? I regard him as my elder brother, but still….’ I caught on in the mock conspiracy, saying, ‘Look, he is standing in that corner, lost in the carvings himself.’ She was tickled to see him. Handing me her camera, she said, ‘Take a picture. I will have a blackmail weapon.’ I said I would take a picture of both. She agreed, and covering her head with a veil, posed for a picture against the temple. U R Ananthamurthy (1932–2014) was a distinguished Kannada writer and public intellectual. He was honoured with the Jnanpith Award in 1994 and Padma Bhushan in 1998, and was one of the finalists of the Man Booker International Prize in 2013. This excerpt from Suragi by U R Ananthamurthy, has been published by Oxford University Press, and republished here with the permission of the publisher.